A test of fuel economy under unpredictable on-road conditions, the MPG Marathon format is simple. Take 10 cars and teams and task them with working out the most economical route between a number of way points, either by the use of printed maps, apps or, if fitted, factory sat-nav. This year’s event started and finished at the Marriott Forest of Arden Hotel, near Coventry. 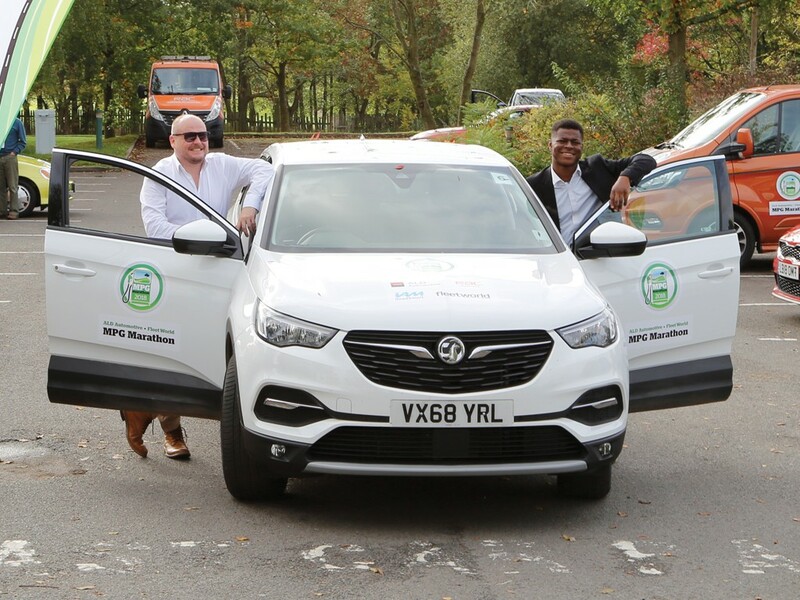 All cars were brimmed and scrutineered by the RAC at the start line, and fitted with Airmax Remote telematics to check routes, track real-time locations and monitor compliance with speed limits. Day one took participants to the challenging and hilly roads of the Peak District, with waypoints at the Belfry golf resort and Uttoxeter adding stop-start traffic before stopping at the Devonshire Arms in Bakewell for a time-enforced lunch stop. The route then wound its way down to a coffee break at the Appleby Inn, Swadlincote, via a waypoint in Belper, before the hardest leg of the day – the return to the hotel and a penultimate waypoint at Coventry’s Ricoh Arena during the afternoon rush hour. Day two was no easier, beginning with a run down to Daventry in rush hour, then on to Silverstone for a rest and caffeine top-up. Lunch was in the Cotswolds, but there was still the small matter of an off-piste waypoint in Aylesbury to get to beforehand, and the final leg took drivers back to Coventry via Stratford-upon-Avon. Refuelling took place in two phases; vehicles were filled at a Shell garage near Coventry, before being painstakingly brimmed by the RAC at the finish line. Final results reflect fuel use (or, for the electric cars, energy use) over the route, plotted by the telematics data. With the more realistic ‘WLTP’ fuel economy test data only weeks away from being released, how would the newcomers stand up to the challenge? It should have been easy. Match a proven economical car – the Civic 1.6 diesel – with last year’s winning driver. Press the start button and collect the prize two days later. It wasn’t. The latest Civic has a peak in terms of economy at unusually low revs. Keep it rolling gently at 35 miles an hour and 1,000 revs in sixth gear, and it really delivers. But you can’t climb hills like that. And this year’s route took us high into the Peak District. Before we reached the dry-stone walls and sheep on the moors, we were sitting at well over 100mpg. The climb slashed 20mpg off that figure. And with the Cotswolds facing us on the second day, we never quite clawed it back. Keeping the revs down also meant we couldn’t reach the 56mph minimum motorway speed limit, enforced by trackers fitted to every car. So, while others headed for the M1, we took the shortest route of all competitors, sticking to back lanes and country roads. But, trickling along in 6th gear through the English countryside, the Honda did the job. Beautifully. The highlight for me was my seriously good co-driver. Françoise is my 23-year-old daughter, and this was her first attempt. Some years ago I won with her brother Doug sharing the wheel. Now both my children have taken on the best drivers in the country. And won. So please excuse the Proud Dad Moment. Eco Tip: Plan ahead – get into the highest gear, at the lowest speed, for the longest time. Arrive at every traffic light as it turns green, and find big gaps in the traffic at every roundabout. Predating CO2 tax, the ‘dash for diesel’ and the first Prius in Europe, the Honda Insight feels better tuned to the demands of today’s new car market than the one it launched into. And it’s still impressive – plug-in hybrids aside, 83.1mpg and 80g/km CO2 remain unbeaten for a production car. So, can it hold its own against today’s most efficient models? Honda’s pursuit of efficiency was ruthless. The Insight was largely built from aluminium to keep the weight down, while its spaceship-like body was optimised for minimal wind resistance. Power comes from a 1.0-litre petrol engine, producing 76bhp with the help of an electric motor, and there’s only space for two on board. It’s also incredibly effective. The Insight will nudge 80mpg with only minor adjustments to driving style, while the low weight means it’s as peppy and sure-footed as a city car, so it’s not struggling to keep pace with traffic. Avoiding the plateau afterwards takes more effort; stopping the engine from shutting down during short stops, keeping the momentum going, and utilising the electric motor assistance. There’s no EV mode, but the Insight advises early up-shifts even on inclines, leaning on the motor to provide extra torque. Shift down, and the engine works harder, using more fuel. Of course, technology has improved. I was reliant on Google Maps to route me around traffic, and the Insight came in a close second to a diesel Civic, which has space for five passengers. But, for all the changes that have happened since, the Insight’s lasting relevance suggests those challenges haven’t moved on much after all. Eco Tip: The manual ’box means it’s possible to hold gears for longer, making full use of the motor to lighten the load on the engine. 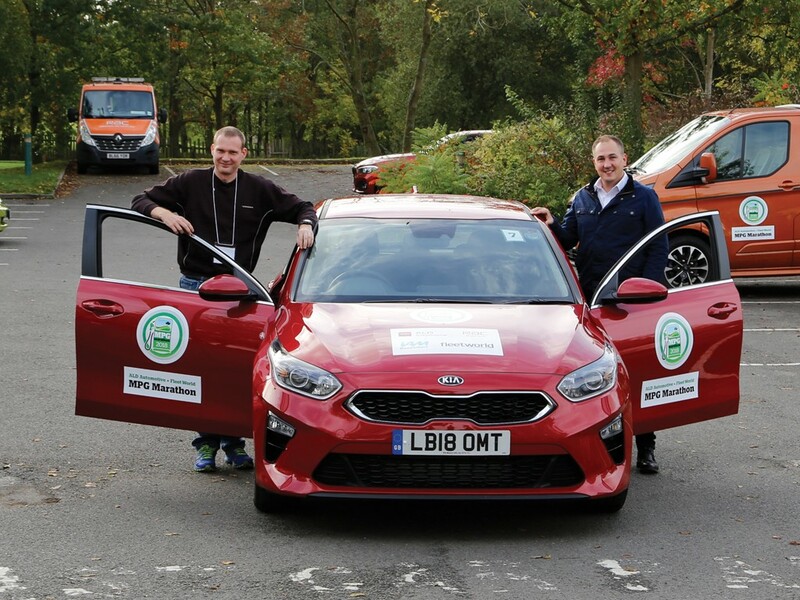 My sixth MPG Marathon was spent in the new Kia Ceed Diesel, with ITV journalist Matthew Price as co-driver on the first day. I’d set my sights on achieving an average of 80mpg over the two-day route. Our car had no sat nav, so finding the waypoints would have been challenging if it didn’t have Android Auto. This uses the Google Maps app, with real-time traffic data finding the best route to a destination while avoiding congestion. All I had to do was dictate the postcode, and it routed me perfectly wherever I had to go next. The weather was ideal for good fuel economy: sunny and with no rain, which can really affect the result. After the first two waypoints, some dual carriageways and motorways allowed the Ceed to excel with its long sixth gear. Cruising at 60mph with the flow of traffic saw the trip computer climb into the 80mpg mark. Could we maintain this? The fuel gauge hadn’t moved by lunchtime, when I swapped co-drivers. My co-driver came prepared with his map book with potential routes highlighted and we reached the finish point at the end of the day one with an indicated 77mpg. Day two was an early start, and we hit our first problem straight away, with an accident causing traffic to come to a standstill. The Ceed’s start-stop technology came into its own here, meaning we lost less than 1mpg for the 30-minute delay. Using a combination of Android Auto and my co-driver’s local knowledge, we finished the route with an impressive 73.99mpg. Eco Tip: Android Auto’s real-time traffic data helps avoid traffic congestion, and its voice recognition is flawless, which means there’s no distraction from the road ahead. While most MPG regulars look for the smallest, most economical car they can find, I found myself tackling this year’s route in one of the largest cars in the competition. I am no stranger to the Mazda6, having run a saloon as a long termer for much of the year, but this was my first time in the recently updated Tourer. With 184bhp and a hefty 328lb.ft of torque on tap under that sculpted bonnet, the 2.2-litre Skyactiv-D diesel certainly has the power to pull such a big car around. A six-speed manual gearbox meant it was relatively easy to keep the engine spinning at less than 2,000rpm, where peak torque is produced, for maximum economy. The car’s weight works in its favour once rolling too, maintaining a cruise with very little pressure on the throttle pedal and trickling through town on minimal rpm. But, you do pay a price when the roads get hilly and by lunchtime of the first day, which was spent climbing what felt like every hill in the Peak District, the figures weren’t looking good. But, with a bit more dual carriageway and flatter terrain on the second day, we managed to pull some of that back and finished ahead of both the NEDC and WLTP figures. Indeed, the result against the WLTP figures shows just what can be achieved with a bit of careful driving. I’ll take that. Eco Tip: As a truck driver I was taught to keep the vehicle moving. Getting 44-tonnes rolling from standstill is very thirsty work. A car may be significantly lighter, but the same theory applies – keep the wheels rolling and you save fuel. Look much further ahead and plan your drive. Softly and sparingly; that’s how I used the BMW’s accelerator over the two days and the 367 miles I racked up on the 2018 MPG Marathon, dutifully following the sat nav’s directions to waypoints in Leicestershire, Lincolnshire, Shropshire, Northamptonshire and Warwickshire. With its lowered suspension, 18-inch wheels, eight-speed automatic transmission and seemingly all the options, it probably wasn’t the right BMW for highlighting the 2.0-litre diesel engine’s capabilities. Still, if I was going slow, I was going to look good doing it! Steering column paddles were fitted, so I thought manual changes and engaging Eco Pro mode was a good idea for economy. I quickly changed my mind, just minutes after leaving our Forest of Arden base, and I left the BMW to change its own gears as I headed to my first waypoint. BMW reckons its EfficientDynamics technology cuts consumption by 20%. I got the hang of using the coasting function on the gearbox, and was pretty chuffed to arrive at lunch with the fuel gauge still showing full. However, things weren’t looking quite so rosy after the early evening traffic to the Ricoh Arena, with the gauge dropping a quart. Day two didn’t start any better, with lots of rush hour traffic and me not following directions carefully enough. Despite my best efforts I was down to half a tank by the final fill-up. Still, looking at other sources, I’m on the money with owners’ figures of between 54.3 and 68.9mpg. Eco Tip: Eco Pro mode offers hints for efficient driving, and gave me an idea of how many miles of extra range I’d gained. The date: Wednesday 17th October. The mission: Achieve the highest MPG. Mission accepted, my trusty co-pilot and I headed into rural Warwickshire, bound for some of the finest landscapes that England has to offer; first, to the rolling Derbyshire Dales, then down into the heart of David Cameron country: the Cotswolds. Our vehicle was the Vauxhall Grandland X with its new 1.5-litre diesel engine. Efficient, but unlikely to out-eco the other competitors; mainly lower medium hatchbacks, some traditionally fuelled, plus the all-new, electric Hyundai Kona. That said, I like a challenge, and I’d like to think that I’m a fairly eco-aware driver, having previously driven over 30,000 miles (not all at once) in a first- generation electric Smart Fortwo. We used the Vauxhall’s ‘Ecological’ sat nav setting, plus cruise control when appropriate, and took note of Airmax Remote’s Driver Feedback Unit. Helped by the absence of traffic on our route, this approach seemed successful, and we were at the top of the league by lunchtime despite the undulating route to get there. But, in urban surroundings, fuel economy plummeted from 58mpg to 36mpg, and improvements on the M1 were negated once we hit Coventry. On day two, a number of navigational blunders (which I take full responsibility for) removed any possible eco-driving advantage. Aware of the excess weight effect, I opted for a small portion of lasagne and chips over lunch, and eschewed pudding altogether. Then, we headed to the start/finish point via the refuelling stops, with the RAC on scrutineering duty. Eco Tip It’s all about physics. To paraphrase Newton, it’s better to keep an object moving, than stopping and starting on the M1. Plan your journey, keep moving, and avoid traffic. Over the past five years, ALD has been using MPG Marathon as a testing ground for alternative mobility and new technology. 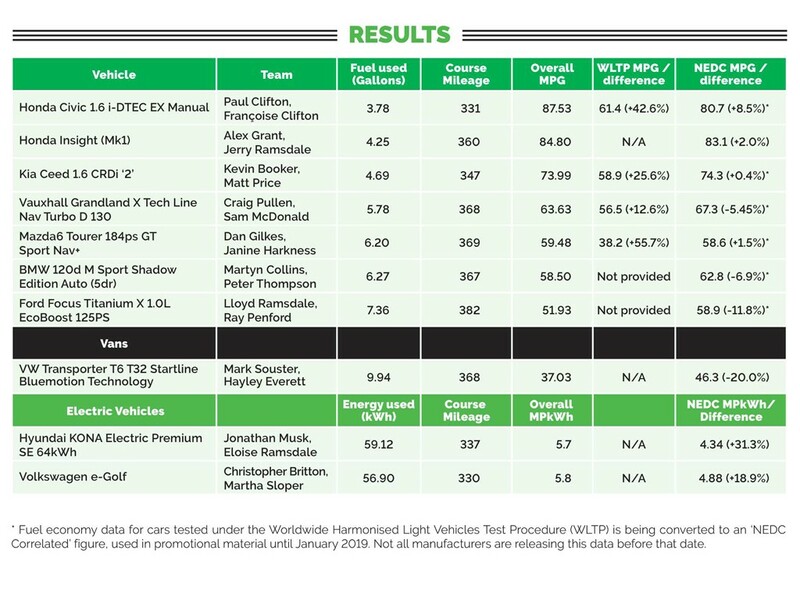 Previous entrants have included a Nissan Leaf, Moto Guzzi, BMW i3 and Hyundai Ioniq, all of which have gone away from the traditional petrol or diesel vehicle entrants. 2018 was no exception, as ALD decided to take on the 330-mile route using an electric Volkswagen Golf. This was a step into the unknown, with initial conclusions not looking favourable: the e-Golf wasn’t meeting its official range of 186 miles, a total calculated using the inaccurate NEDC testing cycle. 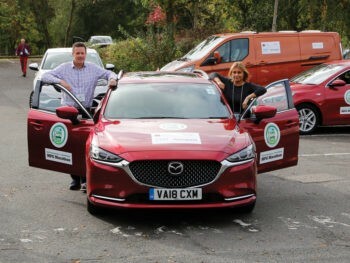 With a couple of hundred miles in the seat, myself and Martha Sloper found our confidence building on the journey to the MPG Marathon, managing an impressive 5.7 miles per kilowatt-hour (MPkWh). We started day one with a predicted range of 148 miles, extended at first by some frugal driving, but the Peak District soon reduced the figure, suggesting we would only manage 90 miles before needing a charge. This was a concern as there were still more than 100 miles to go! Liberal use of the regeneration modes ensured that the battery was charged on every downhill possible, and the range began to fall in line. It was a nervous finish, but the e-Golf arrived back at the hotel with eight miles of range to spare. Day two followed a similar pattern, and an identical performance was recorded, with both days ending at 5.8 mi/kWh – equivalent to over 200 miles on a single charge, narrowly beating the NEDC predicted range. Proof, once again, that electric cars are viable options for a modern fleet driver. Eco Tip Consider the terrain. If you’re going downhill and immediately uphill, consider switching regenerative braking off and allow the car’s momentum to increase, powering you back up the hill. As a newbie to the team, this was my first MPG Marathon, so I hopped in the RAC’s VW Transporter T6 with Mark Souster, RAC Patrol of the Year 2018, who was determined to take up the gauntlet laid down by his predecessor. The first day saw us travel up through the Derbyshire countryside to the village of Bakewell, and after a hilly drive through the peaks, we returned via the Ricoh Arena to Coventry. Although the steep inclines and sharp, winding roads proved challenging for the van, we ended day one feeling positive about its performance. The second day brought a renewed steely determination to improve our performance, and as we embarked on our route through Daventry and across to the picturesque Cotswolds we upped our efficiency. Opting for a route which was heavily motorway and dual carriageway-based suited the van more than the previous day, and with the ground flatter, our mpg continued to rise. 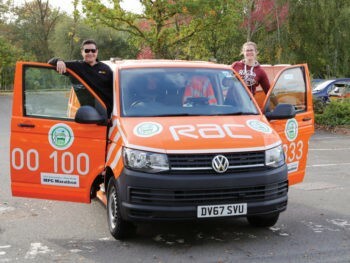 The van’s final score registered 37.03mpg; shy of last year’s effort, but a good result for the RAC nonetheless. Eco Tip Keep looking ahead at the route to make sure, where possible, you avoid traffic and congestion that will lead to the vehicle idling, and therefore lower your fuel efficiency. 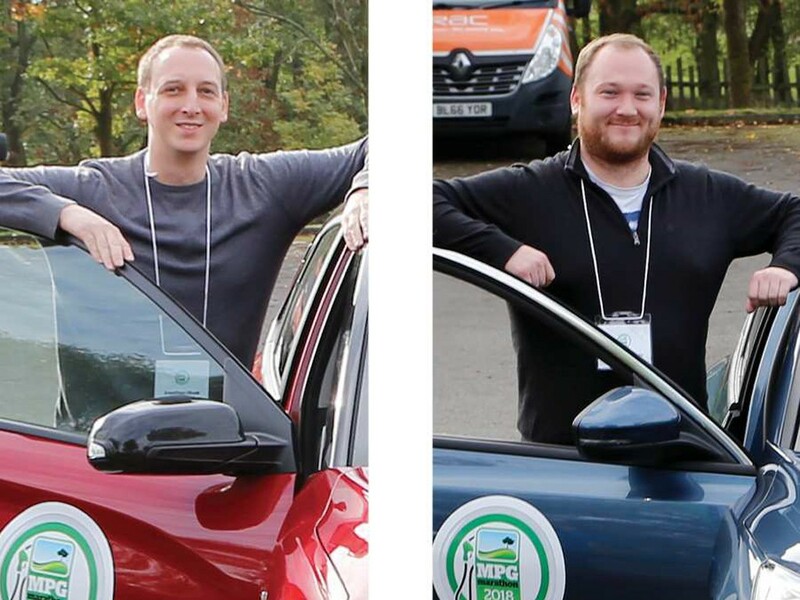 A few weeks after receiving EcoSafe driver training from IAM RoadSmart, first-time MPG Marathon entrants Jonathan Musk and Lloyd Ramsdale put what they had learnt to the test. Under the watchful eye of IAM’s Richard Gladman, we’d successfully established that money can be saved by driving economically – and safely – while not losing time. 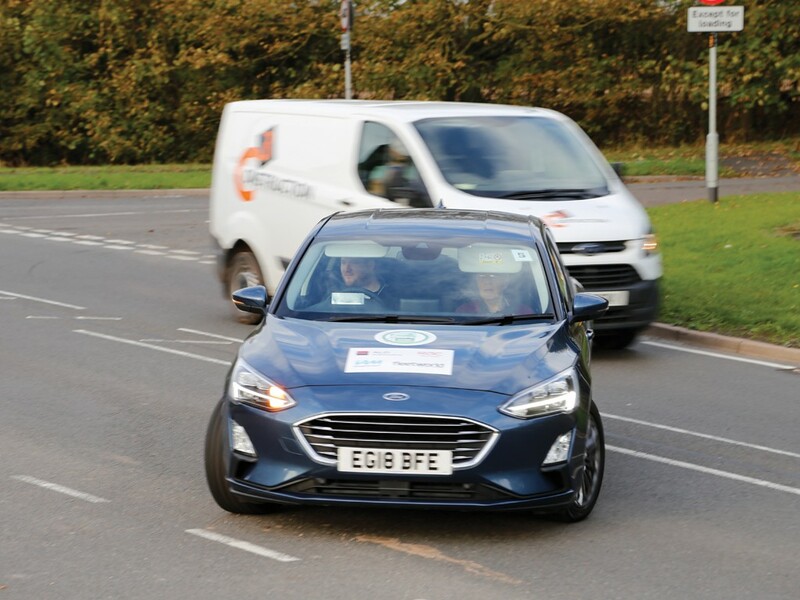 In fact, driving our MG3 hatchback during our training, we’d managed an impressive 12% economy improvement over the official figures, while completing the route at a higher average speed than when driving ‘normally’. Our challenge, however, was not over. The MPG Marathon would serve as the backdrop where we’d aim to hone our skills and put them to the test over a two-day event that would see us travel hundreds of miles encompassing Coventry to the Peak District and the Cotswolds. And we’d be driving different cars; the Hyundai Kona Electric and the latest Ford Focus. Although each car would prove very different from the MG3, the beauty of economical and safe driving practices is that they can be applied to any vehicle. The principles remain the same: drive smoothly, keep distances, keep off the throttle, shift early and avoid excessive speed. Acceleration and setting off from a standstill will always use more energy than it does to keep something moving. That’s the inescapable law of physics. Our job then, would be to put that into practice. The Kona’s WLTP-rated range of 300-miles seemed ambitious, despite the car’s large-capacity 64kWh lithium-ion battery. However, armed with good knowledge of the car, its capabilities and of course IAM’s EcoSafe driver training, it didn’t feel unrealistic. Under some rough calculations, we worked out that we needed to keep the efficiency gauge at 4.6 miles per kilowatt-hour (MPkWh) or above. The terrain and traffic were tough, so forward-planning was critical for maintaining momentum – using gentle acceleration downhill, then coasting up the following uphill stretch. The Kona’s adjustable regenerative braking also proved useful, with zero-regen letting the car coast with minimal energy use, then stepping up the regen to slow for speed-restricted areas. We drove gently on both days. The Kona Electric isn’t a slow car – it’s capable of 0-62mph in sub-eight seconds, though at no point on the economy run was this put to the test. It goes to show, however, that when dialled back, electric cars can offer significant performance on-demand without incurring a permanent fuel consumption penalty as would be the case in your average high-performance petrol or diesel vehicle. After day one, the economy gauge was showing 5.7MPkWh, while at one waypoint we’d actually increased that to 5.8. We had used just 45% of the battery to cover some 170 miles, meaning there’d be plenty for a theoretical range of more than 350 miles. By the end of the second day, we’d covered 337 miles and used the equivalent of 89% battery capacity – with an average efficiency of 5.7MPkWh. Eco TIP Regenerative braking is good for town and city driving, but should be turned off for the best efficiency on other roads. The Ford Focus is a fleet favourite and, specced with a 1.0-litre petrol turbo and six-speed manual gearbox, I was expecting it would do well. And I had IAM’s driver training to put into practice too. However, once under MPG Marathon conditions and working towards a target, you quickly realise that employing all the techniques is harder than anticipated. Day one went well but, after hours and hours of driving, I didn’t see the progress in fuel consumption that I’d hoped for. By day two I began second-guessing what I’d been taught and played around with different driving techniques to see how they’d affect the fuel economy. This didn’t work. Overall, I averaged 51.93mpg, which wasn’t helped by a lack of any route planning and hindered by the generally hilly nature of the roads with abundant and unavoidable stop-start traffic. The built-in Ford sat nav also didn’t help, not displaying turnings far enough in advance. There was also an element of human error involved, with my co-pilot entering one wrong digit on a postcode, meaning we travelled an hour in the wrong direction. This put pressure on me to drive a bit quicker than would have been peak economy, as otherwise we’d have missed the allotted times for the waypoints. The one tip I’d give to anyone eager to learn about EcoSafe driving, and the one thing I will take with me into any future MPG Marathons, is to keep your eyes on the conditions ahead and avoid being fixated on the MPG readout. Eco Tip IAM RoadSmart trains you to focus on the road ahead, followed by an economical driving style. Safe driving becomes second nature. Taking our driver training into the MPG Marathon, we felt ready and prepared for the event. And it’s certainly true that both results would have been much worse without it. However, the event isn’t called a marathon for nothing and, being only human, patience was perhaps our biggest challenge. 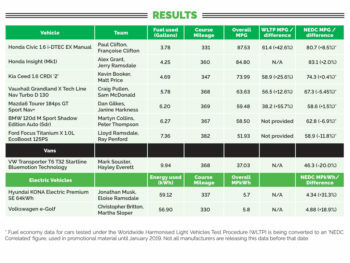 We both practised EcoSafe driving, not hypermiling, and this reflects in our results. Both cars are capable of better economy, but not by much in the real world. Nevertheless, the driver training had proven its point – it had given both of us the skills and understanding necessary to eke the best economy from our vehicles, while travelling safely. But it was left up to us whether or not we followed that methodology and how closely. It’s worth adding a note about the Hyundai Kona Electric too, as in addition to its impressive result, it achieved this with the same speed and time limitations as the petrol and diesel cars on the Marathon. However, in stark contrast to its fossil-fuelled counterparts, its 300+ mile range could be completed with a full charge costing less than a tenner using a home charger. Coupled with sensible EcoSafe driving, this is a real game changer. 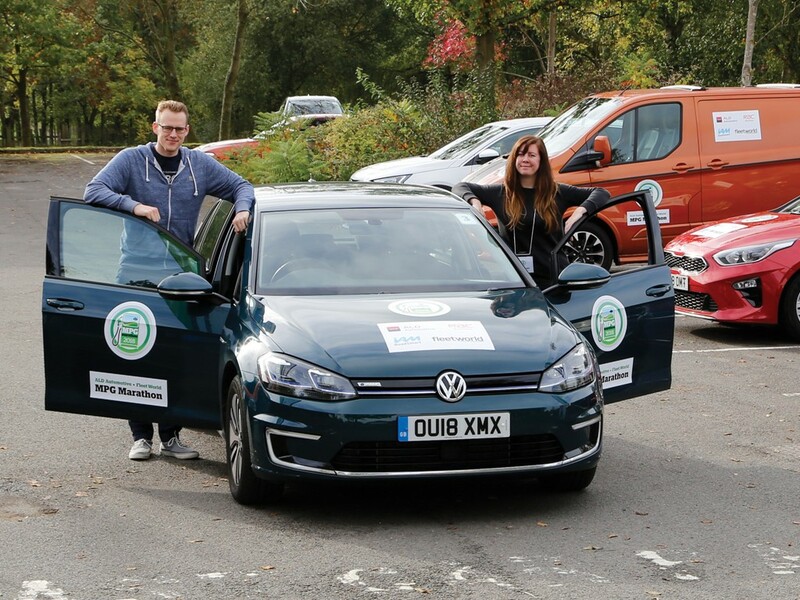 With participants able to select their own routes, vehicles entered in the MPG Marathon were fitted with telematics boxes from Airmax Remote. This not only offered a live overview of where they were during the event itself, but a huge amount of historical data to analyse how vehicles were driven and the different journey types taken. Telematics has become more advanced, but easier than ever to fit. The Airmax Remote plugs into vehicles’ diagnostic ports, taking around 15-20 minutes to be installed into the car – in this case, on site at the Marathon start line. Each vehicle also had a display on the dashboard, showing long-term and real-time driver behaviour via a line of red, orange and green LEDs to help improvements en-route. The data recorded is staggering. Airmax Remote says its technology is aimed at reducing the cost, risk and environmental footprint of a fleet. And that data can be displayed via a customisable portal, giving an overview or enabling deeper analysis of individual groups or drivers. It’s incredibly granular, with league tables reflecting fuel economy and driver behaviour. No two drivers took the same route on either day. 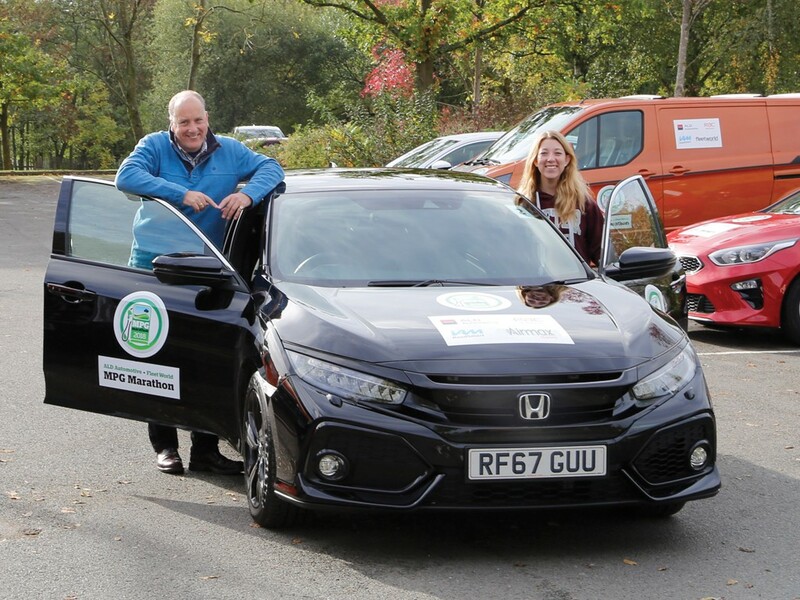 Indeed, there was a near 58-mile difference between the longest and shortest distances covered during the event – the shortest, at 324 miles, was the event-winning Honda Civic. However, this took 40 minutes longer to complete the route than the Kia Ceed in second place. MPG Marathon drivers were, unsurprisingly, not overly prone to speeding or harsh driving. As a group, the most common risk factor was harsh braking, while some vehicles were idling for 6% of the time they were out driving.